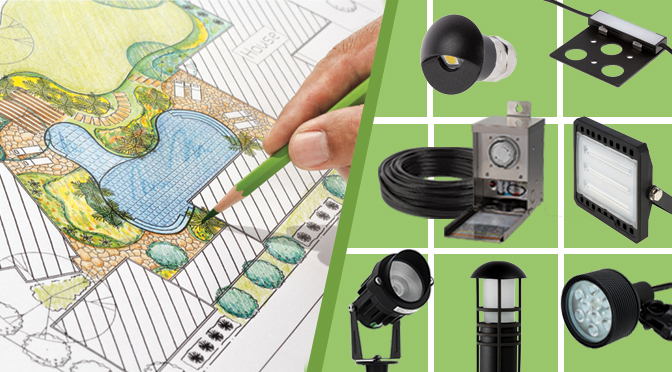 In order to be fully prepared for installing an LED landscape lighting system, you’ll need to know how to plan for it. Planning will help you choose landscape lights as well as the correct transformer, wire, and accessories needed for your particular installation. It will also help you avoid potential installation problems and figure out which wiring method is best. If you’re ready to pull the trigger on purchasing a lighting system, the information in this post will guide you through the process. The first step in your landscape lighting adventure will be figuring out what areas you want to light and what fixtures would be best for them. If you’re not sure what types of fixtures you’ll need, take a look at our landscape lighting design post. It’s separated by different exterior areas and shows each type of light that’s typically used in those locations. When you’re choosing lights, consider whether you want a plug-and-play install or if you’re comfortable working with lights that have pigtail wire leads. Pigtail wires will require the use of silicone-filled wire nuts for connections. This wiring option isn’t complicated by any means; it’s just a bit more involved than plug-and-play connectors as it requires the use of wire cutters and strippers to tie into your main landscape line. Some other things to consider when you’re choosing LED landscape lights are brightness and color or color temperature. If you’re not sure how much brightness you’ll need, consider the size of what you want to illuminate. For small plants, areas, or structures, choose lights with lower lumen outputs. RGB landscape lights are available if you want to use colors other than white. And speaking of white—most fixture types come in one of several correlated color temperatures (CCT), which are shades of white. Depending on the fixture, CCT options can include classic warm white, natural (neutral) white, or cool white, which has a hint of blue in it and is similar to daylight. When you choose lights, add up the total wattage they consume. You’ll need this number for choosing other parts of your landscape lighting system. It’s best to make a sketch of the area where your lights will be installed. When doing this, think about light placement and whether they will come into contact with mowers or trimmers. Walk the install location and take actual measurements. Transfer those measurements to your sketch. This will help you get a clear picture of the best wiring method and how much wire you’ll need. There are several ways you can wire your lights to reduce the amount of wire needed or avoid a power issue known as voltage drop. Let’s discuss what this is. Voltage decreases as it moves through a run of wire and a series of lights. This means that, because each light is receiving a little less than the one before it, lights can appear dimmer toward the end of a series. A small loss is OK, but anything more than a 1.5-volt drop should be corrected. To figure out how much voltage drop your system will experience, use this formula: wire length x total light wattage/wire constant x 2. You’ll need to choose a wire gauge for the purpose of this formula. Start with 12 AWG. If voltage drop is higher than 1.5, try the formula with a larger wire gauge (smaller number). For example, a 10-gauge wire is larger and can handle more wattage than a 12-gauge wire. You’ll also need to add up the combined wattage of all your lights. 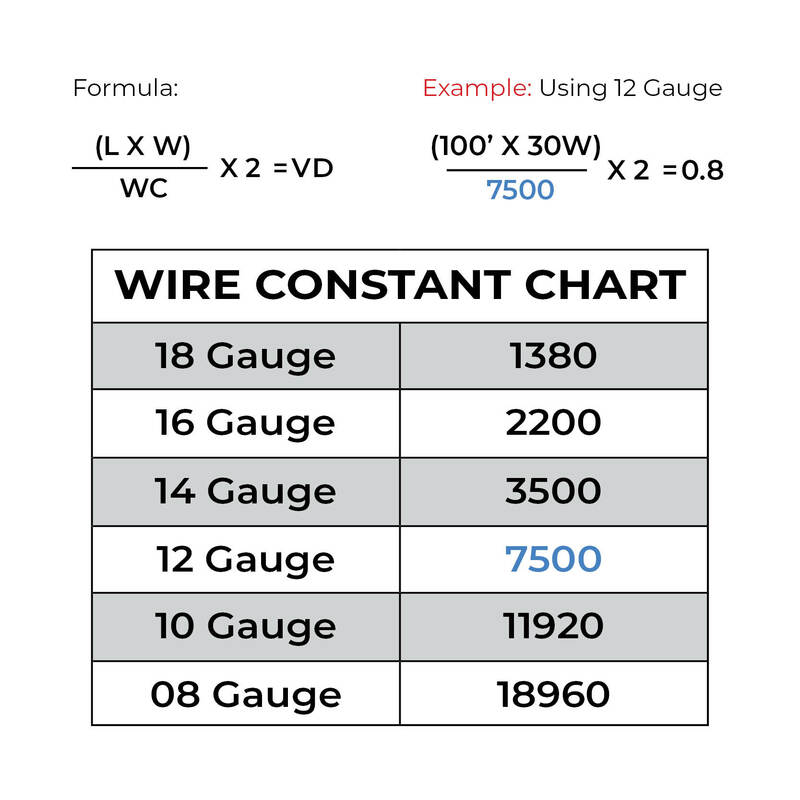 See the table below for wire constants and an example formula where wire length is 100 feet and total light wattage is 30. From our example formula, you can see that voltage drop is 0.8, which is acceptable. This means that 12-gauge wire will work for your landscape lighting system. If you’d rather choose one wire gauge without doing any upfront calculations before purchasing it, you should have a multi-tap transformer. This type of transformer has multiple terminals that supply different voltages to whatever is plugged into them. To determine which tap you should use on your transformer, use the formula above to figure out voltage drop, and add that number to 12, which is the voltage you want your lights to have. For example, if you have a voltage drop of 3, you’ll need to use your transformer’s 15-volt tap (12+3). You can also use a voltmeter to test what each light is receiving after you wire them to your transformer. The daisy-chain method involves end-to-end connection within a series of fixtures, and only an end fixture is connected to the transformer. You can save wire by using this method, but it is not ideal for groups of scattered lights. It can also lead to voltage drop where lights become dimmer toward the end of the series. In this easy-to-install method, a main line connects to a light in the middle of a series. This way, voltage drop is reduced for uniform brightness across all lights in the series. Not only does the T method help with voltage drop, but it also helps save wire. Your main line connects to a central hub where each light is connected separately. This ensures that each light is supplied with the same voltage. You can also connect groups of lights to the hub. Each group will start off with the same supplied voltage, but you can still experience voltage drop within each group. If you’re connecting groups using the hub method, it’s important to calculate voltage drop for each group to determine which wire gauge you need or which tap to use on your transformer. The hub method does use a bit more wire than some other methods, but it eliminates or reduces voltage drop and reduces the number of in-ground splices you’d otherwise have. In the loop method, a series of lights is powered from both ends. The last light in a series runs back to the first fixture or to the transformer. This can be a quick solution for a voltage drop issue with a series of lights, but it can make it difficult to diagnose problems in the future. If you use this method, keep in mind that wire polarity must be maintained from light to light and to the transformer. While it reduces voltage drop and allows for uniform brightness across your fixtures, it also adds to the amount of wiring you’d need. Two or more wire runs are connected directly to the transformer. These runs can have one light or a group of lights connected to them. The split method can reduce voltage drop to each group as a whole, but it can still occur within a series in those groups. Calculate voltage drop for each group to determine which wire gauge or voltage tap to use. To figure out which power supply is best, consider two things: the total wattage of the lights that you’re purchasing and if you anticipate adding lights in the future. When you add up the wattage of all lights, you’ll have a good idea of how powerful your transformer needs to be. However, the total wattage of your lights should be 20 percent less than the transformer’s rated wattage. Simply multiply total light wattage by 1.2 to know which power supply you should buy. For example, if your lights consume 100 watts of power, you’ll need a power supply that’s rated for at least 120 watts (100 x 1.2). If you’re planning on adding more lights in the future, buy a transformer that’s rated for more wattage than you currently need. When you’re choosing a power supply, consider if you want one with multiple voltage taps so that you can easily fix any voltage drop issues. Select low-voltage transformers also come with built-in timers or timer receptacles. They can also be used with add-on dusk-to-dawn photocells to power lights on automatically at dawn and off at dusk. Keep all these options in mind when you’re shopping for your transformer. Before you get ready to install your lights, make sure you have all the tools and accessories required. Below is a basic list of what you might need. Your specific installation could require items that are not on this list. 5) Install Your Landscape Lighting System! Once you have all the necessary supplies, you’re ready to install your lights! It’s best to lay out your entire connected system and test the lights before burying any wire. You can also use a voltmeter to test for voltage drop and see if you need to change to a higher tap on your transformer (if applicable). Try a pre-built LED landscape lighting kit! 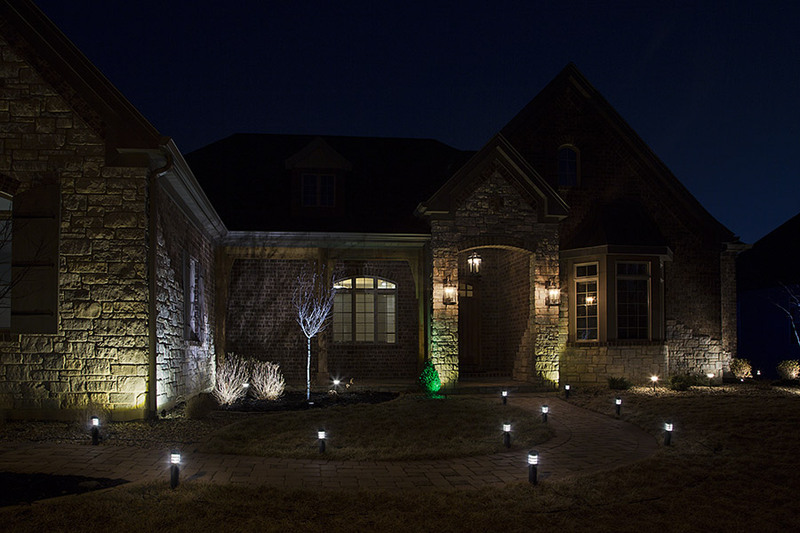 You can save some time by trying one of our LED landscape lighting kits. They eliminate the math involved with figuring out voltage drop or choosing wire and a transformer. These kits come with everything you need: path lights, spotlights, or a combination of both as well as direct burial wire, a transformer, and connectors. If you have any questions, don’t hesitate to call us toll free at 866-590-3533. Our customer service and technical support teams are available from 8:30 a.m. to 8 p.m. CDT Monday-Thursday and 8:30 a.m. to 4 p.m. CDT on Friday.